2011 – “50 Shades of Gray” sells 125 million copies. 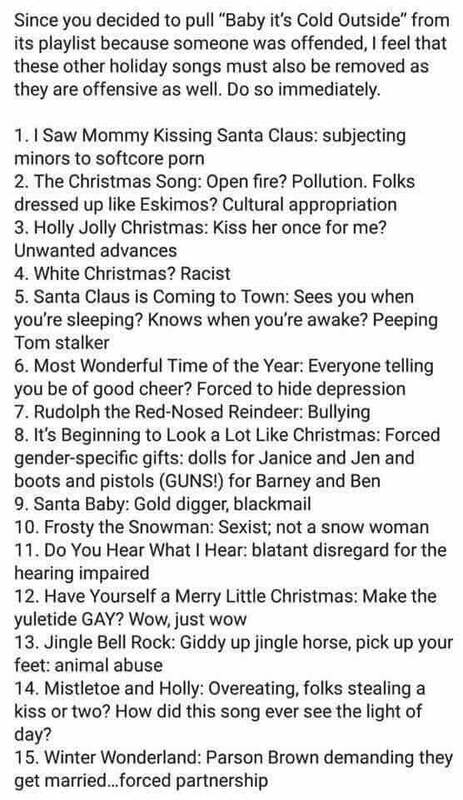 2018 – “Baby, It’s Cold Outside” is offensive. Our World . . .
Feminism – Before & After – Your Choice! One of the main concerns in the world today, are the children who are growing up without values, little needful education and a warped sense of what is right and wrong. There is a try to do unto before you are done to mentality which is wreaking havoc on our American way of life. In our pursuit of happiness, many are conveniently forgetting Who is blessing us with our gladness in life. The powers that be on earth are certainly not in line with the Power that is in Heaven. An older person (who should have known better!) explained to me once that politicians have to please the majority in order to keep peace in the land. And, if the majority favors agendas that might be personally against the morals of the political leader, well then he or she will have to strive to keep his or her personal feelings out of it and govern with a compromised term of office. It is very much a contradiction when you consider “There is no power but from God.” yet many people translate authority to meet their desired way of life rather than using God’s Commandments. The last few months have really brought to light the definitely skewed values that are held by so many people. The mentality seems to be that you should do your job and try not to get caught if you stray in any way with your personal life. Integrity doesn’t seem to have a place in many life styles and beliefs today. And anyone who is shocked at these seemingly sudden turn of events must have been sleeping the last couple of decades or so. We now have laws in our land that sanction and even promote abortion for any reason. Euthanasia is no longer the stuff of science fiction novels. Partial birth abortions that result in total anguish and death for the unborn child is being fought over with the death squads winning. Marriage is an outmoded way of life and pro-creation is reduced from a God-given blessing to nothing more than pro-recreation thanks to the contraceptive mind set being cultivated. The world is not a place to take at face value anymore. Simple trust is not feasible if you want to survive the spiritual holocaust that is feeding into our lives from all sides of our lives. Just perusing the morning newspaper reveals a climate that is, for the most part, incompatible with gaining the final glory of Heaven. The sad thing is that very few are being educated to care about this. And the future of the world depends on the education of the children of today. I suppose you could read these mental wanderings of mine and find me rather pessimistic. Perhaps so, but take a moment to reflect. How many elected, political officials lack basic morality and integrity? How many laws have been passed that are in reality, incompatible with a basic, moral life? How many people overlook elementary yet essential values when voting in elections? How many Catholics are in this group? Currently, we have been blessed with many good changes compliments of a President who cares about this country and not his popularity or pocketbook. President Trump gave up a private life of personal comfort and work to take on the problems besetting this country. The national news stations have turned into gossip columns with personal agendas they air as journalism. They suppress the good and emphasize the bad trying to make lies stick to the President and his administration. I hope more people are encouraged by the truths that are very evident and avoid the non newsworthy information the liberals spout and see the many good things that have happened since Election Day 2016. Out of the Mouths of Babes . . . When Keeping Quiet Might Be Better! Interesting how a teenage boy can command and demand an audience of adults to do his bidding because he says so. I’m getting tired of hearing his name on the news, listening to his foul language, and the lack of research in his pronouncements. Fox News Laura Ingraham called him ‘whiny’ and he immediately calls for a boycott. Sad to say, instead of ignoring this liberal pawn, companies supposedly owned and operated by grownups are falling quickly in line behind a seventeen year old. The world has certainly come to a sorry state. So far, Rachel Ray’s pet food company, Nutrish, was first to declare a boycott. Now, Expedia, Nestle, Hulu, and Wayfair are declaring their support of a child. Well, easy enough to give up Nutrish in my counter boycott – my dogs hated it! There is more than one way to plan a trip so Expedia’s absence from my life is quite okay. Nestle chocolate isn’t that great and there are alternatives to all their products. Hulu and Wayfair are not a constant in my life so closing the door on them works for me. I will, however, make an effort to catch Laura Ingraham’s show as often as possible while observing which of her advertisers are grownup enough to continue their advertising on her show.